Specifically designed for total repair of the eye contour, achieving a triple anti-wrinkle, anti-scalp and antibacterial effect. The exclusive [meso]recovery complex® revitalizes, drains and activates microcirculation. Provides a long-lasting lifting and tensioning effect, visibly decreasing deep wrinkles. The periocular area is smoothed, unified and clarified. Bags and dark circles disappear visibly. 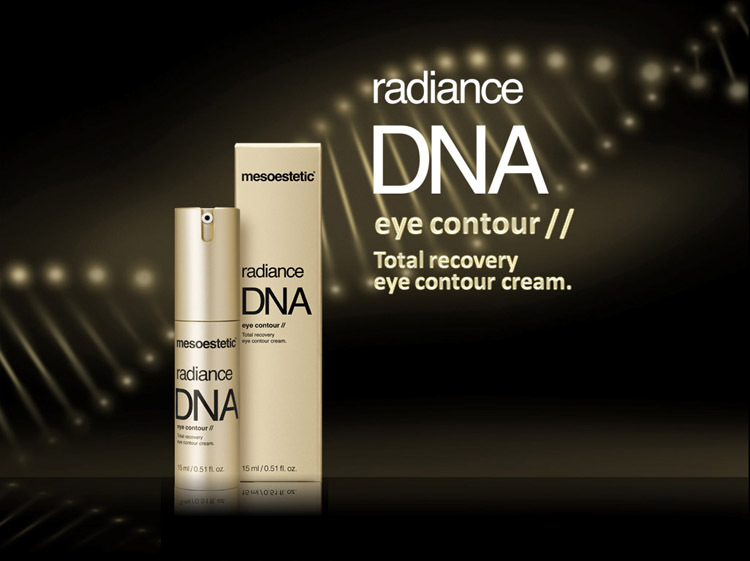 A bottle of Radiance DNA – Eye Contour for home maintenance leads to results obtained in the beauty salon. Specific care created for total eye contour repair, thereby achieving a three-fold effect against: wrinkles, under-eye bags, and circles. The exclusive [meso]recovery complex® revitalizes, drains, and activates microflow. It provides a long-lasting lifting, tightening effect and visibly reduces deep wrinkles. It smoothes out, unifies, and lightens the periocular area. Bags under the eyes and circles disappear visibly.